Venture Deals - Great read for Start-ups! If you are starting a business that aims to raise money from Venture Capital firms, you HAVE to read Venture Deals. 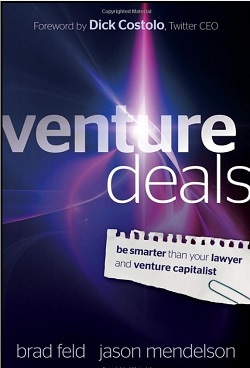 The subtitle is not ‘Be Smarter Than Your Lawyer and Venture Capitalist’ for nothing! This was a great read. The book was written by two partners at a Venture Capital firm in Bolder Colorado. They spared no effort to educate the reader on many aspects of dealing with venture capitalists. It is really like an insider’s guide! Who would not want that? They adequately describe all the parties involved in financing of startups, including the people we all love to hate – Lawyers! They also take the reader on a step-by-step guide on the process of raising money. Most time however is devoted to the term sheet. They break the discussion on the term sheet into three parts. Firstly the authors cover the parts that are related to the economics of the proposed deal, like Price, Liquidation Preferences and Vesting. I particularly enjoyed the explanation around Liquidation Preferences and how Venture Capitalist likes to structure deals. Also interesting how they warn against trying to get to high valuation when selling shares early on to Friends, Family and Fools (FFF), this can backfire big-time. Lots of learning in this chapter! Chapter 5 then deals with the control related elements of the term sheet. They share how to go about setting up the board of directors and potential pitfalls. All other terms are handled in the same chapter and give more than sufficient understanding for somebody about to negotiate a term sheet. Chapter 8 takes you to the inside of a VC firm and even explains some of the unexplainable behaviour VC seems to get up to at times. You will learn how VC makes money, structure funds and manage their cash flow. For how ever the part on negotiations was probably the best! Make sure you don’t miss it – Find out what type of negotiator you are and how to handle anything the VC can through at you! This entry was posted in Book Reviews, Reviews on 2012/10/27 by Justinus.